We are a busy bunch of people. Here are some of the church related activities that take place on a regular basis. Meeting on a Wednesday afternoon, having a programme of talks by visiting speakers. Lead the singing at the Ten-Thirty Service. An active collaboration between a number of chuches in Ilkley. Open daily during the week, our Coffee Centre offers fairly priced refreshments and the opportunity of a listening ear. We are a "Fairtrade Church". We actively encourage the use of Fairtrade goods, having them available for sale on the first Sunday of the month after both morning services. Our Coffee Centre uses Fairtrade products. The local Methodist Circuit of churches - information and current discussions can be found here. Supporting each other in learning about our faith - our HouseGroups are a key part of our spiritual growth. Meets weekly in the Sanctuary for half an hour. Every household associated with Christchurch has a Pastoral Visitor. Details of our Stewardship - giving of time, talent and financial support. Keeping the fabric of the building together. An important part of our service is overseen by this outward looking part of our community. 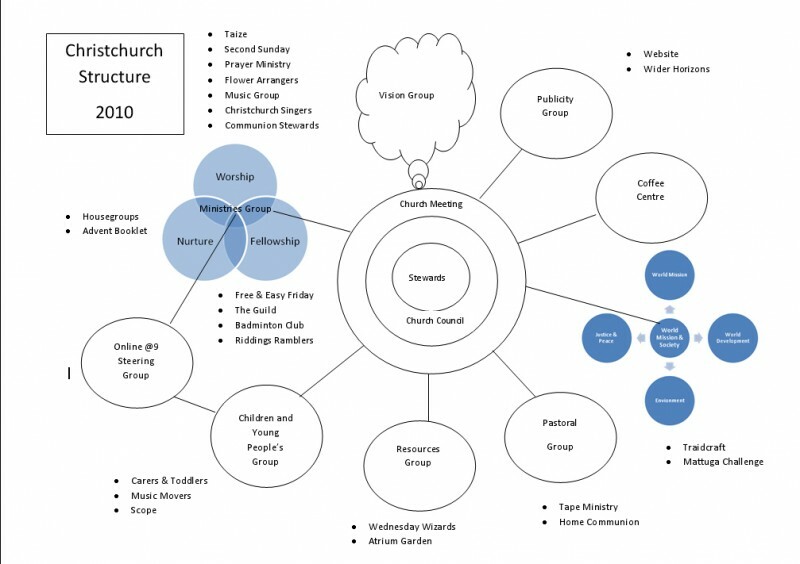 You can download a copy of the Venn diagram of the Church Structure.